Domino Organic Sugar is harvested and milled on the same day from certified organic sugar cane. Starting with a special single crystallization process that preserves the flavor of sun-sweetened sugar cane. 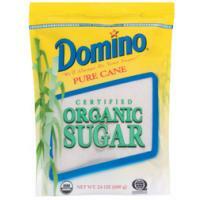 Domino Organic Sugar is made from certified organic sugarcane. Great to get discount on the organic sugar. Thank you!! Thanks again for the discount on the organic sugar!!! I always buy Domino products. They are really good and less expensive then other brands. Excellent product. Use all the time.